There’s a feeling of fantasy and fairytales about this engaging online slot machine from NextGen Gaming – it’s called Ever After and it comes with base game features and free spins as well as an enchanting atmosphere; keep reading to find out more. Ever After is a five reel slot with three rows and two hundred and forty three ways to win; through those opaque reels we have a view of the stone steps of a large castle, surrounded by threatening undergrowth. 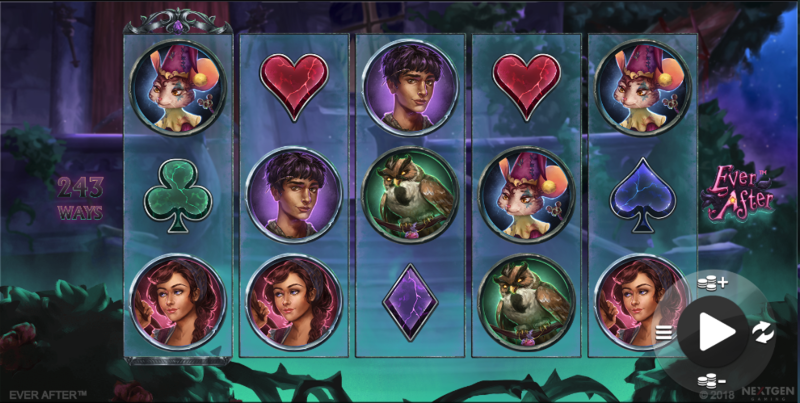 The higher value symbols are characters from this untold story and include the male and female leads, the owl and the mouse; playing card symbols in red, purple, green and blue make up the lower values. The wild is a heart-shaped pink potion which will replace all others to help form winning combos except for the leaded window scatter symbols. Wild – each wild on the reels will expand to fill all positions. High value symbols – transformed into wilds. Low value symbols – upgrade to high value symbols. Scatter – just two are required to trigger the main feature. This is triggered by landing three, four or five of the scatter symbols anywhere in view for which you will receive 6, 12 or 30 free spins respectively; landing two, three, four or five during this round will award 6, 12, 30 or 60 extra spins indefinitely. The Mirror Magnificent feature is active on every spin during the free spins which really helps out with some big wins. There’s a gloomy, fantasy atmosphere to Ever After which is much more enjoyable than it sounds; it’s a slot with some delicate graphics, plenty of clever features and an RTP of 96.53%.